An insect pest from New Zealand that can attack crops and other plants has been found on farmland in Suffolk and Essex. Nigel Cuming, assistant curator at Colchester and Ipswich Museum Service, discovered the first UK populations of the wheat bug in 2007. He found large numbers when surveying North Warren RSPB Reserve in Suffolk. In July 2009 further populations were found at a site in Essex by Jerry Bowdrey, the museum's senior curator. Since his first Suffolk find, Mr Cuming surveyed further sites along the coast in consecutive years and discovered large numbers of adults and nymphs. The bug has been identified as Nysius huttoni White more commonly known as the wheat bug, an endemic pest that attacks a large number of weeds and crops in New Zealand. The bug is reported to favour habitats of sandy soil in the UK sparsely vegetated with Sheep's sorrel. In July 2009 the pest was identified in a field of barley, though it was never seen feeding on the plants. Mr Cuming said: "I discovered this small bug whilst I was surveying an area on North Warren reserve in Suffolk. 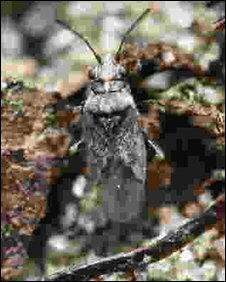 "Amongst the numbers of common insects found was an example of what turned out to be Nysius huttoni. "I attempted identification by direct comparison, research skills and contacts. "Initially the find foxed experts and identification has taken a while, but an expert, Dr Bill Dolling, has pronounced the identification to be Nysius huttoni, a species that is new to Britain."